While maintaining the nutritional material "freeze dried" shut down the deliciousness. If you are pouring the hot water here in 10 seconds! Easy and delicious and easy to make! 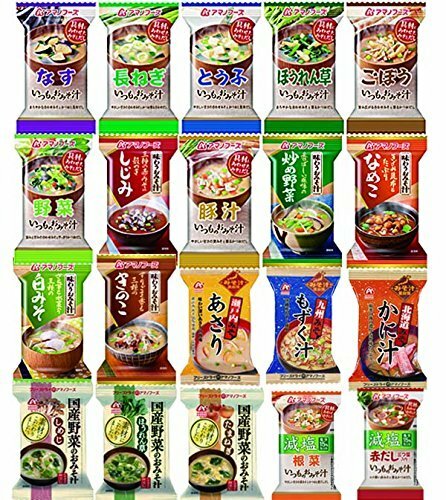 gorgeous miso soup, and stuck to the ingredients of the Amano foods 20items 40pcs food set. None today?? From the every day to drink... in all 20 types of miso soup. Perfect for gift ☆ freeze-dried live taste, smell this. Please take a look at Justice. *Has won praise as a gift. *You want to drink every day. *Be with convenient for those who live alone in one meal at a time. *Accompany the setsubun "ehou" roll ". *Standing in my office desk drawer. If you have any questions about this product by Amano foods, contact us by completing and submitting the form below. If you are looking for a specif part number, please include it with your message.